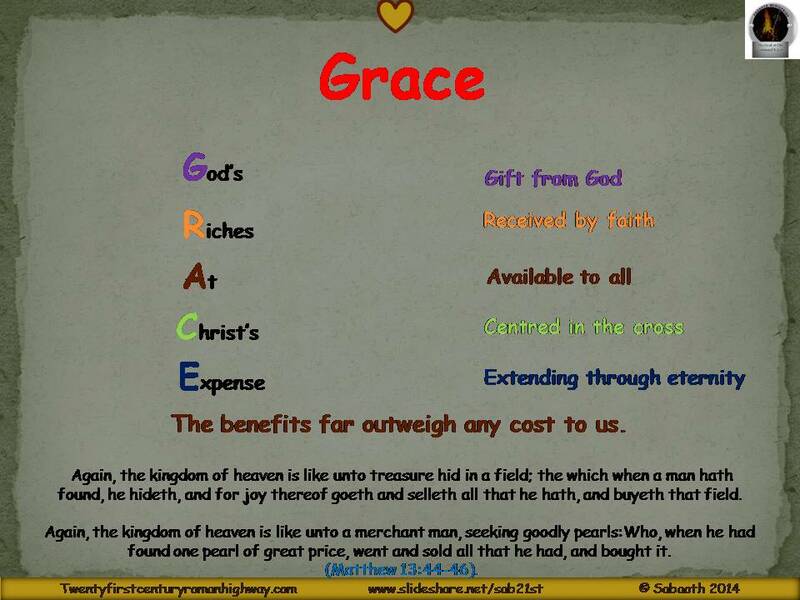 “Charis”, the new testament word for grace is translated to mean favour, benefit, gift, joy, pleasure and thanks. Grace comes from God as He grants favour and blessing on us – it is unmerited favour; a constant and unchangeable power; an embodiment of God’s transcendence, omnipotence and love in our lives – It reaches into eternity beyond our limits and boundaries. “Grace and peace be multiplied unto you through the knowledge of God, and of Jesus our Lord, according as his divine power hath given unto us all things that pertain unto life and godliness, through the knowledge of him that hath called us to glory and virtue” (2 Pet. 1:2-3, KJV, emphasis added). THE FAVOUR OF GOD THAT GIVES US ACCESS TO THE POWER OF GOD FOR EVERYTHING WE NEED FOR LIFE AND GODLINESS. GOD’S ABILITY WORKING IN US, TO HELP US DO WHAT WE CANNOT DO OURSELVES. O lord teach us how to appropriately lay aside our human ability (or even, inability as the case may be), so that we may be able to experience Your power in our life; that power that is the GRACE OF GOD. Several sources of this quotation cite it as originating in an autobiographical book by Leopold Infeld, who introduces the quote as “one of Einstein’s beautiful phrasings.”1 Infeld was assistant to, and then a scientific collaborator with Albert Einstein (at the Institute for Advanced Study, Princeton, New Jersey), so he is presumably able to provide such a quote from first-hand experience. One of the problems on which they worked together was Einstein’s theory of general relativity. They sought to reconcile equations of the gravitational field with equations of motion. (What does that all mean? Don’t ask. Just know there are elusive, complex calculations involved.) At the same time, they wanted “to pay any price in computation to obtain a theory which is cleaner and purer from the logical point of view. God does see any situation the way we see it, because His capacity to comprehend the situation is too far greater than what can be compared to ours due to His vast experience that lasts from eternity to eternity. Do not fret because of those who are evil or be envious of those who do wrong; for like the grass they will soon wither, like green plants they will soon die away. Trust in the LORD and do good; dwell in the land and enjoy safe pasture. Take delight in the LORD, and he will give you the desires of your heart. Commit your way to the LORD; trust in him and he will do this: He will make your righteous reward shine like the dawn, your vindication like the noonday sun. Be still before the LORD and wait patiently for him; do not fret when people succeed in their ways, when they carry out their wicked schemes. Refrain from anger and turn from wrath; do not fret—it leads only to evil. For those who are evil will be destroyed, but those who hope in the LORD will inherit the land. A little while, and the wicked will be no more; though you look for them, they will not be found. But the meek will inherit the land and enjoy peace and prosperity. The wicked plot against the righteous and gnash their teeth at them; but the Lord laughs at the wicked, for he knows their day is coming. The wicked draw the sword and bend the bow to bring down the poor and needy, to slay those whose ways are upright. But their swords will pierce their own hearts, and their bows will be broken. Better the little that the righteous have than the wealth of many wicked; for the power of the wicked will be broken, but the LORD upholds the righteous. The blameless spend their days under the LORD’s care, and their inheritance will endure forever. In times of disaster they will not wither; in days of famine they will enjoy plenty. But the wicked will perish: Though the LORD’s enemies are like the flowers of the field, they will be consumed, they will go up in smoke. The wicked borrow and do not repay, but the righteous give generously; those the LORD blesses will inherit the land, but those he curses will be destroyed. The LORD makes firm the steps of the one who delights in him; though he may stumble, he will not fall, for the LORD upholds him with his hand. I was young and now I am old, yet I have never seen the righteous forsaken or their children begging bread. They are always generous and lend freely; their children will be a blessing. Turn from evil and do good; then you will dwell in the land forever. For the LORD loves the just and will not forsake his faithful ones. Wrongdoers will be completely destroyed; the offspring of the wicked will perish. The righteous will inherit the land and dwell in it forever. The mouths of the righteous utter wisdom, and their tongues speak what is just. The law of their God is in their hearts; their feet do not slip.The wicked lie in wait for the righteous, intent on putting them to death; but the LORD will not leave them in the power of the wicked or let them be condemned when brought to trial. Hope in the LORD and keep his way. He will exalt you to inherit the land; when the wicked are destroyed, you will see it. I have seen a wicked and ruthless man flourishing like a luxuriant native tree, but he soon passed away and was no more; though I looked for him, he could not be found. Consider the blameless, observe the upright; a future awaits those who seek peace. But all sinners will be destroyed; there will be no future for the wicked. The salvation of the righteous comes from the LORD; he is their stronghold in time of trouble. The LORD helps them and delivers them; he delivers them from the wicked and saves them, because they take refuge in him. DILIGENTLY WATCH WHAT YOU SOW!!!!!! The evil you frown at, encourage, nurture (covertly or outright), aid and abet today; will surely come back tomorrow to be your own inevitable albatross; because what a man sows he must reap. Worse still some reaping are bound to go for generations yet unborn – DILIGENTLY WATCH WHAT YOU SOW!!!!!! PLAN A (The Glory of God) – Blessed be the God and Father of our Lord Jesus Christ, who hath blessed us with all spiritual blessings in heavenly places in Christ: According as he hath chosen us in him before the foundation of the world, that we should be holy and without blame before him in love: Having predestinated us unto the adoption of children by Jesus Christ to himself, according to the good pleasure of his will, To the praise of the glory of his grace, wherein he hath made us accepted in the beloved. In our last 4 posts on this series FORESIGHT OF THE MASTER PLANNER, we looked at the first of three questions asked to see if Jesus is the “Saviour” and “liberator” of mankind; we took a look at the question, IS JESUS MORE THAN MAN? we looked at Jesus as the Son of (M)man and also Jesus as the Son of God, where we looked at the essence or reality of His nature – the essential nature or reality of Jesus Christ, in which the divine and the human are believed to be combined – How it is possible for Him to be God and man at the same time? We then continued with our look at the first in our classifications of who Jesus Christ is with regards to His Nature, His Pre-Existence and how He fits into the eternal purpose of the Master Planner. Then we went on to look at the question – IS JESUS EQUAL WITH GOD? Two – Yet, let it be clearly known here that being willing to suffer is not the same thing as suffering itself. Three – Here we see the dilemma in the Lord’s service. Sometimes, for example, in the work which God has called us to do, we find ourselves in physical need because He seemingly has not provided sufficiently for us. What shall we do amidst such trial? In looking at the first stanza of the hymn, Trust and Obey by John Henry Sammis as part of this mini-series In the posts, we have looked at God’s good will, His original plan of His eternal purpose Ultimately being, PLAN A (The Glory of God)– We saw that it is safe to say that His good will, His eternal purpose, is a plan to ultimately, bring us to His Glory, with provision made for perceived blunders we will make along the way – this provision being The Gospel of Christ Jesus. We then started on this Journey of Regeneration– God’s Provisions & Man’s Acts. We then looked at what God has received from the death of Jesus Christ irrespective of a sinner believing and trusting in Jesus or not Propitiation – It Is Finished; before that, Redemption then Justification – You Are Not Guilty!!!! Says God as part of God’s Regeneration of man. We then had a look at the work of the Holy Spirit in this eternal purpose of God especially the work of the Holy Spirit in the salvation of man. We looked at this from the perspective of the specific activities of the Holy Spirit in the salvation of man – His activities in the eternal Purpose of God and in His bringing life to man’s deadened conscience through quickening of the human spirit. Part 2 – Removes His Sins and Their Consequences The purpose conviction of sin is CHANGE OF HEART; CHANGE OF HEART! in unregenerate man as a result of conviction? ; Product of conviction in an un-regenerated man; The purpose of conviction of sin is to change the heart; Grace From Cross At Calvary; Regeneration of the spirit (Quickening); A Quickened Heart (At Salvation). We then looked at Christian conversion – Repentance In Christian Conversion; The importance of having a Good Conscience: Useful Heart and finally the place of Faith In Christian Conversion. So we have overall looked at PLAN A (The Glory of God) & PLAN A1 (The Gospel of Christ), we will now continue with PLAN A2 (Back on Track). In PLAN A2 (Back on Track) we will have a look at Christian Transformation; Glory and The proving of Faith; Freedom from the dominion of indwelling sin (This involves: Freedom from Sin, Sanctification mainly dis-positional); growth in life; building up and maturing. “For the time is come that JUDGEMENT MUST BEGIN AT THE HOUSE OF GOD: and if it first begin at us, what shall the end be of them that obey not the gospel of God? And if the righteous scarcely be saved, where shall the ungodly and the sinner appear? Wherefore let them that suffer according to the will of God commit the keeping of their souls to him in well doing, as unto a faithful Creator” (1Peter 4:17) . Like I said in our last post, Church folks have been preached at to “accept their sufferings” – “suffer suffer for world – enjoy for heaven” while most of those who do the preaching (this days) tend to live opulent lifestyles that is being envied by showbiz folks – These make the notion of suffering in the course of doing the work of God become a very touchy issue which when not taken before the Lord in prayer could lead to shipwreck. In our last post as part of our look at the obedience of our Lord and Saviour Jesus Christ as seen in His emptying and humbling of Himself we looked at Difference Between Actual Suffering & Having A Mind To Suffer we will now continue with the second part of the discourse by watchman Nee Called Having A Mind To Suffer. “Now the brother shall betray the brother to death, and the father the son; and children shall rise up against their parents, and shall cause them to be put to death. And ye shall be hated of all men for my name’s sake: but he that shall endure unto the end, the same shall be saved” (Mark 13:12-13). “And because iniquity shall abound, the love of many shall wax cold“ (Matthew 24:12) . “It is of the LORD’s mercies that we are not consumed, because his compassions fail not. They are new every morning: great is thy faithfulness. The LORD is my portion, saith my soul; therefore will I hope in him. The LORD is good unto them that wait for him, to the soul that seeketh him. It is good that a man should both hope and quietly wait for the salvation of the LORD. It is good for a man that he bear the yoke in his youth“ (Lamentations 3:22-27). “For then must he often have suffered since the foundation of the world: but now once in the end of the world hath he appeared to put away sin by the sacrifice of himself: And as it is appointed unto men once to die, but after this the judgment” (Heb. 9:26-27). “Wherefore Jesus also, that he might sanctify the people with his own blood, suffered without the gate. Let us go forth therefore unto him without the camp, bearing his reproach. For here have we no continuing city, but we seek one to come. By him therefore let us offer the sacrifice of praise to God continually, that is, the fruit of our lips giving thanks to his name. For even hereunto were ye called: because Christ also suffered for us, leaving us an example, that ye should follow his steps” (Heb. 13:12-15). “For even hereunto were ye called: because Christ also suffered for us, leaving us an example, that ye should follow his steps: Who did no sin, neither was guile found in his mouth: Who, when he was reviled, reviled not again; when he suffered, he threatened not; but committed himself to him that judgeth righteously: Who his own self bare our sins in his own body on the tree, that we, being dead to sins, should live unto righteousness: by whose stripes ye were healed. For ye were as sheep going astray; but are now returned unto the Shepherd and Bishop of your souls” (1Pet 2:21-25). “For Christ also hath once suffered for sins, the just for the unjust, that he might bring us to God, being put to death in the flesh, but quickened by the Spirit” (1Pet. 3:18). “Forasmuch then as Christ hath suffered for us in the flesh, arm yourselves likewise with the same mind: for he that hath suffered in the flesh hath ceased from sin; That he no longer should live the rest of his time in the flesh to the lusts of men, but to the will of God. For the time past of our life may suffice us to have wrought the will of the Gentiles, when we walked in lasciviousness, lusts, excess of wine, revellings, banquetings, and abominable idolatries: Wherein they think it strange that ye run not with them to the same excess of riot, speaking evil of you: Who shall give account to him that is ready to judge the quick and the dead” (1Pet. 4:1-5). “But the God of all grace, who hath called us unto his eternal glory by Christ Jesus, after that ye have suffered a while, make you perfect, stablish, strengthen, settle you“ (1Pe:5:10). Difference Between Actual Suffering & Having A Mind To Suffer. Here we see the dilemma in the Lord’s service. Sometimes, for example, in the work which God has called us to do, we find ourselves in physical need because He seemingly has not provided sufficiently for us. What shall we do amidst such trial? Well, if we stop working because of material straitness, might not our Lord be surprised and He not be justified in asking us what is the basis and reason for our service? So that in God’s service, having the mind to suffer is a decisive factor. For you cannot come to the Lord and say you quit because you encounter some unexpected difficulty or trial. No one who serves the Lord may stay home during rain and go forth only after the sun comes out. If you have the mind to suffer, then you will work on in spite of privation, difficulty, pain, sickness, or even approaching death. Possessing a mind to suffer, you will stand up and declare to the devil, “I will work on, no matter what may come!” But if you are inwardly afraid, you will fall away at whatever provocation Satan may cast along your path. If you say, “I am not afraid of hunger,” then when Satan threatens you with hunger, you stand firm and the devil flees. If you say, “I am not afraid of coldness,” you will stand and Satan must withdraw when the latter tempts you with coldness. But if you should say, “I am afraid of being sick,” Satan will make you sick and thus you will be vanquished. Without a mind to suffer, you are subject to Satanic attack at this very point of your fear, and you will be finished. But if you declare, “I am not afraid of sickness,” Satan will be bound. In the light of all this, every one of God’s workmen must be prepared before the Lord to go forth with a fearless heart. Whatever may happen – whether it be family trouble, physical ailment, hunger or cold – you shall continue to serve. With the result that the Enemy can do nothing to you. Such an attitude reveals having the mind to suffer. On the other hand, when such an attitude is lacking, you will be tempted with the very thing of which you are afraid. And the consequence will be that you will invariably withdraw from the work of God. In short, you become unusable. May we all say to God, “For the sake of Your love and because of the grace You have given me today, I am fully committed to Your work. Come heaven or come hell, I will work on. Wether competent or incompetent, I shall pursue the work to its very end.” Without such a heart as this we will be open to the attack of the Enemy at our point of weakness. We will quickly be finished and reduced to ineffectiveness. For this reason we must plead with God to show mercy towards us and grant us this mind to suffer. To have this mind is to be inwardly ready for the Lord regardless what event or future circumstance may overtake us. Having such a mind to suffer does not necessarily automatically incur suffering; probably, there will be no suffering; yet an inward determination anchors us firmly. And whoever has this inner assurance is fortified against trouble of any kind. But whoever lacks such certitude will collapse when confronted with trouble. Have you now realized the absolute necessity for having such a mind? The way of service lies not in suffering, but in possessing the mind to suffer. That is to say, you thank God for hunger and nakedness as well as for food and clothing. These things create no difficulty in your life. Neither good nor bad represents any problem to you at all. Please understand that Christians do not ever seek to suffer, they must simply have a mind to suffer. They are prepared to press on in the face of whatever difficulties come their way. But if this should remain an unsettled issue in your life, then nothing is settled. Let us take what may occur in travel as an example of what we have been saying here. It is true that some people may be physically weak and need to sleep on a better bed. But if you as God’s servant insist that you must sleep on a more comfortable bed because of your feebleness, then Satan can attack you at this very point and cause you to have an uncomfortable bed to sleep on. To have the mind to suffer denotes that, regardless of the condition of the bed, you will work on. If the Lord so arranges for you to sleep on a better bed, do not prefer to sleep on the floor. You should sleep on any kind of bed He provides for you. No matter what the condition of the bed is, you continue to serve and will not shrink back. Such an attitude is what the Scriptures call having the mind to suffer. Some brother may be living under a poorer material condition. By this alone it cannot be assumed that he has the mind to suffer. Do not conclude that the materially poorer brother must certainly be one who possesses a greater mind to suffer than a materially better-off brother. Only those who have truly consecrated themselves to the Lord are in possession of such a mind. Such a heart to endure suffering knows no measure nor end. You may go to one place and sleep on the floor. You may go to another place, and there is no floor for you to sleep on but only a pile of hay in the mud. What will you do in such a circumstance? Someone may accept it with great reluctance. Nevertheless, though he suffers, his suffering has a measure or boundary to it. He may be willing to sleep on the floor, but that is the extent to which he can manage the situation – he cannot lower himself further by sleeping in the hay on the muddy ground. By this he seems to say that his standard of living is already low enough and cannot go any lower. This only affirms that he has the fact of suffering but not the mind to suffer. On the other hand, there are other brothers and sisters who in their daily living enjoy more material comforts and yet when their standard of living is compelled by circumstance to be lowered, they can take it in stride as though nothing has happened. They can sleep on the floor or even on muddy ground spread with hay. They utter not a word of reluctance or complaint, for they gladly accept the provision. Now this is having a mind to suffer. And God will choose such people to serve Him. So our issue today is not over how much we suffer but over what is the measure or boundary to our endurance. Suffering may not be necessary for us, but having the mind to suffer is a must. The Lord will not purposely put us in continuous trial or hardship; He only desires to create in us a mind to suffer. No one who goes forth to serve God can be strong without possessing this kind of mind. Else he will be a feeble workman. He will pity, favor and shed tears for himself at the least difficulty or inconvenience. He will sigh and say, “How have I fallen into such a trying situation!” This reminds me of the instance when on one occasion a sister was weeping. Another sister who had served the Lord many years asked her: “But for whom are you weeping?” Alas, many weep for themselves. They bemoan the fact that, being so lovely and so precious, they have now been demoted into this uninviting, unpleasant place or situation. So they weep for themselves. Such people are the weakest, and they are the quickest to fold when the going gets rough. The questions before you is this: when trial and pain come your way, where is your heart? On the one hand is your hardship; on the other hand is the Lord’s work. In the even you do not have the mind to suffer, you will immediately sacrifice the work of the Lord. You will muse, “How can I possibly take care of the Lord’s work when I can hardly take care of my distress!” Oh, at all costs, we must arm ourselves with the mind to suffer, for there is no question that our suffering shall indeed subside if we lay down the work; but in so doing God’s work will suffer loss. Here, then, is the problem: when there is a lack of a mind to suffer, or when there is no mind present to suffer at all, Satan is able to tempt us to desert our work for the Lord at any time. yet we are to be people who maintain the glory of God. Come life or come death, we must fulfill our duty. We have to finish our course and persevere to the end. This that I have said is not meant to imply that it is expected that our laboring brothers and sisters are to suffer. Under ordinary situations, our need for food, clothing and lodging is legitimate and good in God’s sight to be met. We do not in the slightest encourage brothers and sisters to seek out sufferings to bear, nor would we ever put suffering upon anyone: we would that God would supply our every need so that we would lack in nothing. Yet we still maintain that to have a mind to suffer is an absolute necessity for those who are God’s workmen. On the one hand, we are aware that God would not withhold any good thing from us; on the other hand, we must possess the mind to suffer. If not, we shall fall at the least inconvenience or trouble. How much of a mind to suffer must we posses? The demand of the Scripture is: “faithful unto death” (Rev. 2:10c). In other words, we must be able to endure anything, even death itself. We are not advocating extremes here. Yet having the mind to suffer isnever moderately defined in God’s word. If moderation is called for in the case of some of you workers because of excess, then let the Lord, the Church or the more matured brethren temper your excess. But so far as you are concerned, you must give your all. How can you ever serve if you temper yourself? There is no way for you to work. A person who looks upon his own life in his own hand is very limited in the work of God. Every one of us who would be in God’s service must be prepared to be faithful unto death. This is the only path we can travel. It goes without saying that the Lord will not ask you to die because of your faithfulness. Nonetheless, the preserving of our life is up to the Lord and is not a matter for our concern. Should the Lord so order, that is His business. On our side, we must always be ready to lay down our life. No matter how painful, we must learn to endure. This one thing is most effective – that of serving the Lord even unto death. The more you stand on this ground, the less the Enemy has any way with you. Alas, how people love their own selves. A little pain draws out rivers of tears and eruptions of sighs. Were we not to love ourselves, these tears and sighs would vanish from the scene. In order to travel this road God’s servants must be “violent” people. They must say to the Lord, “Lord, whether You have ordained for me to suffer or not, I am fully prepared to suffer.” Again and again I would say that suffering is a limited matter, whereas the mind to suffer is an unlimited one. the amount of hardship or trial the Lord allows you to endure is measurable, but the extent of your readiness to suffer before the Lord is to be immeasurable. On the other hand, if your mind to suffer is measurable, then you do not really have the mind to suffer. Any limit here renders such a person ineffective in the Lord’s work. Anything less than what God demands makes one’s service unacceptable to Him. Never entertain the thought that the mind to suffer is restricted to only a certain measure of suffering. No, no, it is to be measureless, even unto death. Otherwise, Satan will be able to tempt you and make you fall. “They over came him [Satan] because of the blood of the Lamb, and because of the word of their testimony; and they loved not their life even unto death” (Rev. 12:11). What can the Enemy do if your conscience is void of offence, you have the word of the testimony of Christ’s victory, and you love not your life even unto death? The Enemy has no way in the slightest to deal with those who love not their lives in that way! We all know the story of Job. The reason why Satan attacked him so fiercely is because God’s Enemy just could not believe that a man would not seek to preserve his own life for the Lord’s sake. Hence he challenged Jehovah, saying, “Skin for skin, yes, all that a man has will he give for his life. But put forth Your hand now, and touch his bone and his flesh, and he will renounce You to Your face” (Job 2:4-5). Satan knew that if he touched Job’s life and the latter loved his life, then God’s enemy would have his way. How very clear are the implications of the words in Rev. 12:11: Satan is at his wit’s end towards those who love not their lives even unto death. The failure of God’s workmen can be plainly perceived right here – that they love their lives too much. Let us ask ourselves which is more important, the work of God or our own life? our duty to God or our own life? people’s souls or our own life? the Church of God or our own life? the testimony of God on earth or our own life? Those who love themselves cannot serve the Lord; and those who suffer may not necessarily be serving the Lord. Only those who have the mind to suffer, who have an unlimited measure of the mind to suffer, who have a mind that “love[s] not their life even unto death” – these, and these alone, are qualified to serve God. Today, let us offer ourselves afresh to the Lord, not offering ourselves to suffer, but simply offering ourselves to give our all. The Lord may not have destined us to be martyrs, yet we must have the mind to suffer even unto a martyr’s death if that be His will. Let us acknowledge and confess how often the failure of our work can be traced to our indolence, self-protection and lack of self-denial. Do not presume that people are blind, that the eyes of other brothers and sisters are closed. Let us realize that they can easily detect whether we are giving our all or keeping back something. When the Lord calls us, He calls us to put all on the altar. May He be gracious to us that none of us will so treasure his or her life as to be unwilling to lay it down. From the depths of our hearts we must cultivate the habit of not loving or pitying ourselves. Otherwise, our work will be circumscribed. The measure and extent of our having the mind to suffer will determine the measure and extent of our spiritual work for the Lord. Any limitation in having this mind limits the scope of spiritual service. It also limits the blessing to people. We need not use any other standard by which to measure God’s blessing than that of having the mind to suffer. And with a measureless mind to suffer there shall come an unlimited scope of blessing. O Lord You have said in Your word in 1Corinthians 11:31-32 that “for if we would judge ourselves, we should not be judged. But when we are judged, we are chastened of the Lord, that we should not be condemned with the world”: We pray this day O Lord that, You will multiply the Father’s glorious riches in You unto us and fill us with the Knowledge of The Father’s will to RIGHTEOUSLY JUDGE OURSELVES, SO THAT WE WILL NOT BE JUDGED AND CONDEMNED WITH THE WORLD. Once again as ever, I thank the Lord for restoring me to this work and for His protection and never failing compassion: In the world we live in today, where the notion of suffering for the Gospel has been made to look like a show of naivety; the notion of suffering in the course of doing the work of God become a very touchy issue which when not taken before the Lord in prayer could lead to shipwreck. “And thou hast removed my soul far off from peace: I forgat prosperity. And I said, My strength and my hope is perished from the LORD: Remembering mine affliction and my misery, the wormwood and the gall. My soul hath them still in remembrance, and is humbled in me. This I recall to my mind, therefore have I hope. It is of the LORD’s mercies that we are not consumed, because his compassions fail not. They are new every morning: great is thy faithfulness. The LORD is my portion, saith my soul; therefore will I hope in him. The LORD is good unto them that wait for him, to the soul that seeketh him. It is good that a man should both hope and quietly wait for the salvation of the LORD. It is good for a man that he bear the yoke in his youth. He sitteth alone and keepeth silence, because he hath borne it upon him. He putteth his mouth in the dust; if so be there may be hope. He giveth his cheek to him that smiteth him: he is filled full with reproach. For the Lord will not cast off for ever: But though he cause grief, yet will he have compassion according to the multitude of his mercies. For he doth not afflict willingly nor grieve the children of men“. (Lamentations 3:17-33). Now, In our last post we started our look at the two sections of the acts by our lord and Saviour Jesus Christ that (as we will look at in the near future) led to His being exalted by God The Father and given a name that is above all names; these two sections of the acts as explained by watchman Nee being His emptying Himself. The second section is on His humbling Himself. We saw how the Lord lowered Himself twice, first in emptying Himself in His deity, and then in humbling Himself in His humanity: That His being the Lord was something given to Him by God The Father; being made the Lord is something that happened after He emptied Himself in His deity. We saw that the deity of our Lord Jesus is something that is based on what He is. Being God is His original position; but His attainment of the position of Lord is based on what He has done. But before we continue with this, I would like to have a look at this example of our Lord and Saviour’s suffering as a consequence of His emptying Himself in His deity, and then in humbling Himself in His humanity: and see The Difference Between Actual Suffering & Having A Mind To Suffer. The Difference Between Actual Suffering & Having A Mind To Suffer. Watchman Nee endured much suffering for the sake of the New Testament ministry. Due to his absoluteness in following the Lord and his faithfulness in fulfilling the Lord’s commission, he underwent frequent mistreatment as well as lifelong hardships. Because he unwaveringly fought the battle for the Lord’s move, he was under constant attack from God’s enemy. At the same time, he was also under God’s sovereign hand. He recognized the sovereign arrangements of God in his environment not merely as a divinely apportioned “thorn in the flesh,” but more importantly, as a means by which God was able to deal with him. Due to both the enemy’s attacks and God’s faithful environmental dealings, Watchman Nee lived a life of suffering. The majority of his sufferings came from five sources: poverty, ill health, various denominations, dissenting brothers and sisters in the local churches, and imprisonment. All who serve God need to possess an additional characteristic – that of having a mind to suffer (see 1 Pet. 4:1). This too is most essential. But before we address this specific question, let us first deal generally with the attitude of a Christian toward suffering. The teaching of Scripture is quite plain: God has no desire to see His people suffer. There is a certain philosophical concept abroad which posits the notions that the human body is intrinsically evil – and that therefore we humans must suffer and not enjoy blessing. People with such a concept view any kind of enjoyment as something wrong. As servants of the Lord, however, we go forth to represent Him. We ought to be clear that the above concept is not a Christian one. The Bible definitely shows us that God has never purposed to have His children suffer. On the contrary, it plainly tells us that the Lord has not withheld any good thing from us: “Jehovah is my shepherd; I shall not want” (Psa. 23:1; see also, 1 Tim. 6:17). The words “I shall not want” here, do not mean that I shall have no need. They simply mean that with Jehovah as my Shepherd, I shall not be in need of any kind. For example, if you have just had a solid meal, and someone offers you a bowl of congee (watery rice), you will doubtless say, “I am full, I do not need it.” In a similar vein, what the psalmist is saying here is that, having the Lord as my Shepherd, I shall be in lack of nothing. In other words, God does not desire that we be in lack; on the contrary, He wants us to be full; and so, “no good thing does He withhold from those who walk uprightly” (Psa. 84:11). Beginning at the very outset of the Old Testament record, the Bible consistently reveals to us how God takes care of His people, minimizes their problems and mitigates their sufferings so as to separate them from the heathen nations. Take as just one example the circumstances among the Hebrews in the land of Egypt. The land of Goshen where they lived was different from the rest of Egypt. God’s blessing was always present in Goshen. Hence we believers must not bring this kind of suffering philosophy into our Christian faith. Let us not confuse Christianity by mixing non-Christian notions into it. This is something we need to watch. On the other hand, this is not to suggest that God will not test His children nor discipline them: He does indeed test them and chasten them. Yet we need to distinguish this from the philosophical concept of suffering just mentioned. In ordinary times God usually dispenses grace, taking care of, supporting and supplying His own children with whatever they need. But in times of necessity He will also test and chasten His own. Yet even here, this is not to say that He will try them every day. He only chastens when chastening is necessary. He never chastens on a daily basis or at every moment: He only does so sometimes, not all the time. Our God is habitually mindful of us to provide for our every need. Nevertheless, if we persist in our obstinacy in a given area of life, He will have to allow the trial and discipline to continue – although according to His usual way He loves to deal kindly with us and is unwilling to make us suffer. It is the will of our Father God to give all good things to His children. We may therefore receive and enjoy all which the Lord has given to us. What, then, is the meaning of the suffering for the saint which we find in the Bible? In the Scriptures we find that to suffer is a path which we deliberately choose to take before the Lord. This is to say that the Lord has indeed provided us with days of abundant grace; but today, for the sake of being God’s servants and serving Him, we instead choose this way of suffering. In short, this path is a selected way. It is not unlike what the three mighty men of David did who could have easily followed their leader and lived on peacefully, but once learning of David’s longing to taste water from the well by the gate of his home village of Bethlehem, they jeopardized their lives by breaking through the host of the Philistine army to draw water out of that very well (see 2 Sam. 23:14-17). Hence to suffer is something chosen by us; it is not ordained. We choose before God to suffer. We are willing to do so for the sake of serving the Lord. According to God’s providence, we may not have to suffer many pains; yet because we desire to serve Him, we gladly choose a path which differs from the common one. And this is what is meant by having a mind to suffer. To arm ourselves with such a mind is a basic characteristic of any person who would wish to serve God. Without this willingness, we will not be able to serve well in anything. Lacking this, our service will be very superficial. Yet, let it be clearly know here that being willing to suffer is not the same thing as suffering itself. It simply means that before God I have a desire of being willing to endure hardship, difficulty or trial for the Lord. I am prepared to do so and will gladly do so for Him. And this is having the mind to suffer. Whoever has this mind may not in fact suffer, yet in his mind and heart he has committed himself to do so gladly for the Lord. Suppose, for example, that today, God supplies you with food and clothing and better lodging with better furniture. It is not wrong for you to enjoy these things. You may accept from the Lord whatever He has provided; nonetheless, you still possess a heart willing to suffer for Him. Though you do not experience any physical hardship at the moment, nevertheless your mind is still willing to experience that for the Lord. Hence the issue lies not in outward happenings but in your heart desire. When you are in a most favourable situation, do you still possess the mind to suffer? The Lord may not arrange to have us endure hardship every day, but all who work the work of God must not lack the mind to endure such a thing each day. Suffering may not be a daily experience, yet having a mind to suffer must be present daily. The problem we face is that many brothers and sisters, as well as members of their families, shrink back at the slightest provocation. They do not possess the mind to suffer. When the Lord arranges to let us have a favourable environment, without any lack in material things, and with a relatively healthy body, we can serve Him daily and well. But once we encounter a little trial and meet up with the slightest trivial problem, our whole being collapses. This betrays the fact that we do not have the heart to suffer. How can we possibly stand any test if we do not have such a heart? Having the mind to suffer speaks of my readiness before God to suffer. I am willing to go through trial, and I choose the path of hardship. It is up to the Lord whether or not to put suffering in my path, but on my part I am always prepared to suffer. Thus when His providential changes comes and trials fall upon me, I will not be surprised but rather feel that this is what I should go through in the first place. In the event I can only accept God’s favourable arrangement and am unable to endure any trial, then as soon as the circumstances shift in the latter direction, I am broken and my work for the Lord ceases. Now this is a clear indication that I do not have the mind to suffer. Do please understand that work cannot wait for you. Whether you have food or not, you nonetheless must work. Whether you are clothed or not, you must nevertheless continue serving the Lord. When you are well you work; when you feel uncomfortable you still work. You serve whether in health or in sickness. But this shall you find out if you are armed with the mind to suffer or not. Yet this is an awesome weapon, before which Satan is unquestionably bound. Otherwise, once trial and trouble come, your work instantly ceases. Some brothers and sisters have suffered, and yet they do not see the preciousness of suffering before God. And as a consequence they are not in the least thankful to the Lord. On the contrary, they may at times even murmur and complain. They become apprehensive if such a day does not speedily pass. They may have prayers, but they never give praise. Whatever has come upon them under the discipline of the Holy Spirit they will not gladly accept. They expect such a time to quickly fade away. This kind of attitude plainly manifests their lack of having a heart to suffer. Allow me to say that if you do not possess the mind to suffer during peaceful days which the Lord has given you, you will only be able to proceed when the way is smooth, because as soon as the road turns muddy, you will stop serving. This ought not to be so. Let me reiterate what was said earlier, that having the mind to suffer is not suffering itself. You may in truth possess such a mind and yet the Lord may not see fit to give you suffering. Even so, if and when you are in fact touched with hardship or trial, you will not shrink back, because within you dwells a heart to suffer. We need to note, however, that not all who suffer have the mind to do so. Many are going through difficulty and trial, and yet they may not possess the mind to suffer. So that among those who suffer, there are those with the mind to do so and others without the mind so to do. Quite a number of brothers and sisters cry almost daily for deliverance from the things they must endure. They are daily in distress, hoping day and night that such a time will soon pass away. Such people have no mind to suffer in the midst of hardship. Therefore, let all who are under trials – whether physical, financial or otherwise – remember this: that what counts before the Lord is not whether you suffer, but whether you have the mind to suffer. Make no mistake in thinking that because you suffer greatly, you are therefore enduring hardship and trouble for the Lord. Without a doubt your circumstance is painful, but it needs to be asked how much of a mind to suffer for the Lord do you really have? Do you choose this path of suffering before the Lord? or are you complaining, annoyed, self-pitying and self-seeking when you do suffer? Let it be plainly understood that people can undergo much heart pain or actual physical trial and yet simultaneously have no mind to do so. Possessing a mind to suffer is a much deeper issue than undergoing the suffering itself. To have the mind to suffer may not issue forth in one suffering outwardly; but by the same token, for a person to suffer outwardly may not mean he has the mind to suffer. We can also put it this way, that the materially poor may not be spiritually poor, for many who go through much material hardship and trial are rich in the spirit in that they do have a mind to suffer; yet there are many brothers and sisters who, though they might equally be going through difficulty and material hardship, do not have a mind to suffer. And should the Lord allow these latter to choose, they would rather not suffer, neither for a month, nor for a day – nay, not even for a moment. They do not possess a heart to suffer. A person who lacks this character attitude shall find his labour in the Lord limited. For when the outside demand exceeds his ability, he will immediately withdraw. He is unable to sacrifice all. What he treasures he keeps for himself. He can only be engaged in the smoothest service during the most convenient days. He needs the Lord to remove all the obstacles for him so that he may work peacefully. Yet how surprising it is that a person who serves the Lord should make such a demand. So let us clearly understand what is mean by having the mind to suffer. A brother who is living peacefully may have more of such a mind than he who is actually suffering. In human eyes, of these two brethren, the one under trial is undoubtedly the one who is suffering. Yet in God’s eyes, the brother in peace who definitely has the mind to suffer would be more precious to the Lord. This is because what the Lord values the most in His children is not the suffering itself but their having a heart to suffer. Yet because the Lord has no intention of making us suffer, let us not therefore think that our suffering itself has any merit. May we ever keep in mind that the one thing God requires of us to respond well to is to be willing to have the mind to suffer. We must be armed with this very weapon. Without this as a weapon, we cannot fight the battle for the Lord. We will instead retreat at the least hint of hardship. We will not be able to endure the least pain or pay the smallest price. We will immediately shrink back. In view of this, the question to be put to you is not how much you suffer but how much you are willing to suffer. Naturally we would expect a brother who encounters much pain to have received more grace from God. Even so, we may not be able to find help from that brother simply because we later discover that within him there is no heart to suffer. How totally unwilling he is in this area. He has in truth gone through much trial and tribulation, but he has not learned any lesson before God because his heart is full of rebellion. We are therefore shown the difference here between the mind to suffer and suffering itself. We cannot in any way substitute the latter for the former. O Lord, we thank You for the examples that you have set before us; we ask that the Holy Spirit may apply these words to the practical situations of our lives and show us how to follow in Your footsteps so that our Christian lives can be effective as we are continually enabled by the Holy Spirit to make the deliberate choice before You, to cultivate a mind to suffer and to realise how sure it is that our Father in You Christ Jesus will enable us to live it out.